Implement and sustain a high-performing PLC. These how-to guides—authored by renowned PLC experts—are packed with user-friendly solutions for you and your entire team. You’ll discover practical, research-based strategies for committing to districtwide implementation, investigate why strong leadership is a crucial element of successful PLCs, and explore tools and techniques for monitoring progress to ensure far-reaching, lasting results. 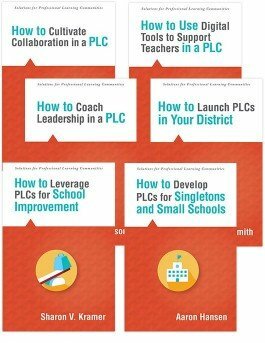 Discover how PLCs can work for singletons and small schools. Learn how to develop a guiding coalition and foundational common language. Leverage digital tools to support PLCs. Gain strategies to build collaboration and leadership capacity. Explore the impact of PLCs on continuous school improvement.